Hello, friends! I am very excited to be participating in the Third Birthday Celebration for Newton's Nook Designs! I absolutely love Jen and her fabulous stamp designs and I am so excited to see that you guys love Newton's Nook, too! I was lucky enough to snag the brand new Party Pops stamps and dies to use for today's hop and boy do I LOVE them!!! Celebrate with Newton's Nook Designs for a chance to win! Would you like to win a $25 store credit to spend at Newton's Nook Designs online shop? 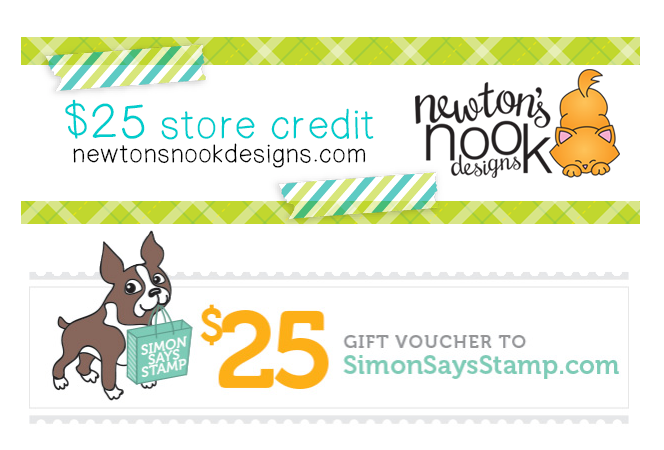 How about a $25 Gift Voucher to Simon Says Stamp? EVERY Blog Stop in the hop today is giving away one of each! WHAT?! That's CRAZY!!!! And AWESOME!!!! Here's how to win: We will pick two random winners from each blog listed below (one to receive a store credit to Newton's Nook Designs and one to receive a gift voucher to Simon Says Stamp). Winners will be chosen at random from the comments posted on each of the blogs listed below. You have until Sunday, July 17th at 9pm CDT to comment. Winners will be announced on NND blog post on Monday, July 18th and will need to contact us to claim their prize. Also... the first 100 orders this weekend will receive a FREE Thank You stamp! SUCH CUTENESS!!! That font, though... it is seriously fabulous. You need it. Happy 3rd Birthday Newton's Nook Designs! You did a great job with this set! I love it, it is so summer! Plus I love sweet treats! Thanks for celebrating their birthday! I love this popsicle card... I like that you used a soft color on them too. Great card bit cold here for a ice lolly but here is hoping for better weather. Sweet card Jingle! Great monochromatic scheme. Really makes your sentiment stand out. Ooh orange dreamsicles. Yummy! Great card. Popsicles are perfect for the heat we are having! Love the color! So sweet! Haha. Happy birthday to Newton's Nook! Mouth watering popsicles!!!! This is what 'Summer' is all about LOL!!! This set is perfect to use for my little girl that I take care of sometimes. She loves Pops. She only gets them at Aunt Sharon's house.This is a great stamps set. Oh, you just had to POP that comment in there, didn't you?! Sweet card! Clean simple card that looks so cute. Love the fun Party Pops set! Sweet card! LOVE this card. Im waiting for my stamp set with popsicles and ice cream cones and have 100's of ideas. Delightful! Thanks for the inspiration! Love your clean and simple card! Ahh, How adorable. Love it. This looks like a really cute set - love your card! Really adorable card, I love the melon colour that you used! Wow! Beautiful card!!! So cute! Such a fun, summery card! Quick and easy, just right for the busy summer and so cute. Love the card it simple and very pretty. I need a popsicle stamp. So many cute cards made with them. Your card is perfect for summertime! I could use one of these "cool" pops right about now. This card is so cute and cool. Very refreshing! Love clean and simple cads, this is cute! Blog hops and new stamps are the best! Love seeing everyone's choices! These ice cream is definitely the perfect. 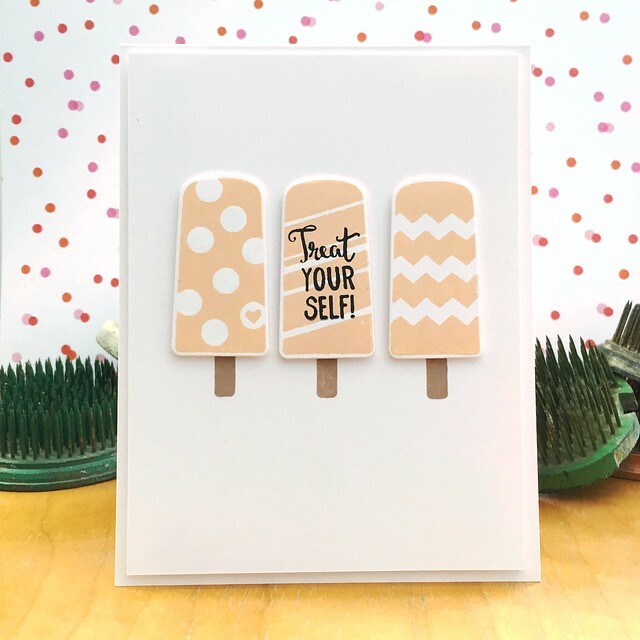 Love this card the popsicle are great love the soft colors...just in time for the south very hot...Happy Anniversary to Newtowns and the design team such a wonderful group keep sharing Thanks again for a chance to Win!!!!!! Happy Anniversary Newton's Nook! These popsickles are too cute! Great card! Fun for the "younger" set out of school for the Summer! Love this set! Sweet sweet CAS card!! A cute and sweet card design! It does indeed "pop." :) Thanks for sharing. really cute, and great for summer! Super cute and adorable, Jingle!! Love the colors you used - so light and refreshing for the hot summer day we have right now. Very cute--I like the melon ink you used. Sweet! And just what I need in this heat. Love those popsicles. Great summer image! What a yummy card! Love it! Yum! What a fun card! I love these popsicle stamps/dies! This is a fabulous release! I love the popsicle stamps and dies. I really love how it all ties together. Your card is so cute! And I did see what you did up there "popping" the pun in!! Great job!! I love the soft pastel color against the white background. Clean, crisp and summery! Very nice! Thank you for sharing! Cute card. Thanks for sharing this yummy card! You have to love the Popsicles, so cute! Your card is just lovely, like the colours of your ice creams. Fun summer card, Jennifer, love ice cream and these are just waiting for me, fun summer stamps...but then again ice cream is all year around! Your card is vey yummy ! Yummy peach pops! Summer and popsicles always a treat Card brings back many happy memories. Happy 3rd Anniversary to Newtons Nook Dsigns. Such cute treats! Great set and love how you used it! Your popsicle look so yummy! Oh, summer. Rally like your card. Cute card, I love this new release. Such a summery card. Love it! Perfect summertime card and makes me think of the ice cream truck that came around when I was a kid. Your card is perfect for summer. I could use one of those ice pops right now! Your card is so "cool" perfect for our 91 degree (and climbing) dry heat here in Arizona. Your card made me wish I had some creamsicles in my fridge right now. Beautiful card. Looks good enough to eat!?? I need to Treat Myself to some Newton's Nook products! Adorable popsicles..love your choice of colour. Summer Treats to make us all happy and they don't drip! Love how clean this is! Soft color too! The perfect summer treat! So many fun possibilities with this set! Congrats to Newtons Nook and the wonderful blog hop. The first thing I think of in summer is ice cream! What a cute card! I love this unique and pretty color in your Party Pops card! Beautiful and crisp! Such a sweet card! :) Thanks for sharing. The card is so pretty for iths simplicity. So cute. They look like Dreamcicles! Yum! Love monochromatic!!!! Great job! I hadn't seen this brand until I started the blog hop today. I'll definitely have to check them out. Really like how you used the same colors! Very nice! I am so glad that I treated myself to a visit to your blog - what an AMAZING card!! So cool and fun!! Your card is so adorable! 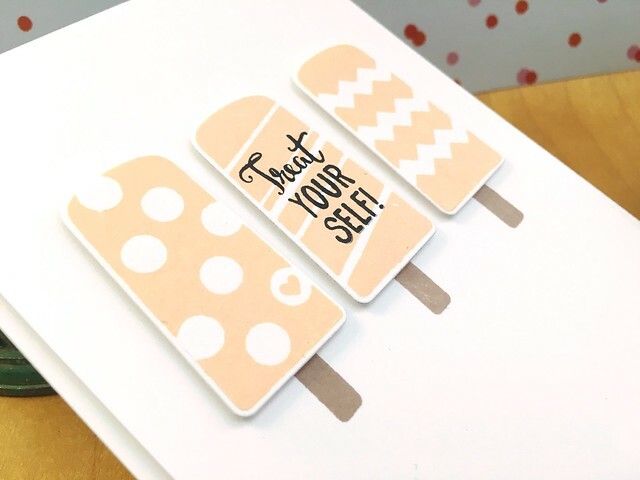 I love that sweet melon color you used and the way you stamped black over the top! BAM! Thanks so much for celebrating 3 years with us! Loving this card ... sweet! Those popsicle stamps are adorable! And the card is super cute too! Yumm. creamsicles. summer. relax. Yes! Your fun design offers some good advice on a day like today with temps around 90. These stamps and dies are great! Love the colour of your iceblocks and such a clean, CAS design. Perfection!! Very very lovely card thanks for sharing! card for a hot day like we are having today. What a nice popsicle set. Thanks for sharing. SUPER CUTE and TASTY card Jennifer!! !